In a bold new move, Facebook has taken on the role of content censor on its own platform, and has done so in its notoriously sneaky style. It is by chance that I learned about the change in my Facebook settings, thanks to the fact that I am lucky enough to be connected to some of the thought leaders in the Privacy field, such as Rebecca Herold, also known as @PrivacyProf. She posted a note on her wall today, which I will reproduce below to give the authors the credit they deserve. NEW FACEBOOK SETTINGS RESTRICTING YOUR VIEWING PLEASURE! Don’t worry, everyone still loves you and nobody has intentionally blocked you. The problem is that a large chunk of your friend/fan list can’t see anything you post because the “New Facebook” has a newsfeed setting that, by default, is automatically set to ONLY SHOW POSTS FROM PEOPLE WHO YOU’VE RECENTLY INTERACTED WITH OR INTERACTED WITH THE MOST (which would be limited to the couple of weeks just before people started switching to the new profile). So in other words, for both business and personal pages, unless your friends/fans commented on one of your posts within those few weeks or vice versa – you are now invisible to them and they are invisible to you! Scroll down to the bottom of the Newsfeed on your HOME page and click on “Edit Options”. In the popup, click on the dropdown menu next to ‘Show posts from:’and select “All Of Your Friends and Pages” and then click Save. Note: This is the fix for personal pages but I am unsure of whether or not the business pages are set up the same way. Simply posting an update about it won’t do any good because lots of your friends/fans already can’t see your posts by default. You’ll either have to send out a message to everyone on your list (which I’m not even sure business pages can do and is a rather tedious method) or post an event explaining the situation like this one and invite your entire fan base and/or friend list. You can also tweet about it hoping that most of your fellow facebookers are also on twitter. PLEASE FEEL FREE TO SHARE THIS NOTE WITH AS MANY PEOPLE AS YOU CAN SO WE CAN TRY AND GET EVERYONE INFORMED AS SOON AS POSSIBLE. Anyone who isn’t seeing your posts right now will never see them until they have changed their settings as explained above. 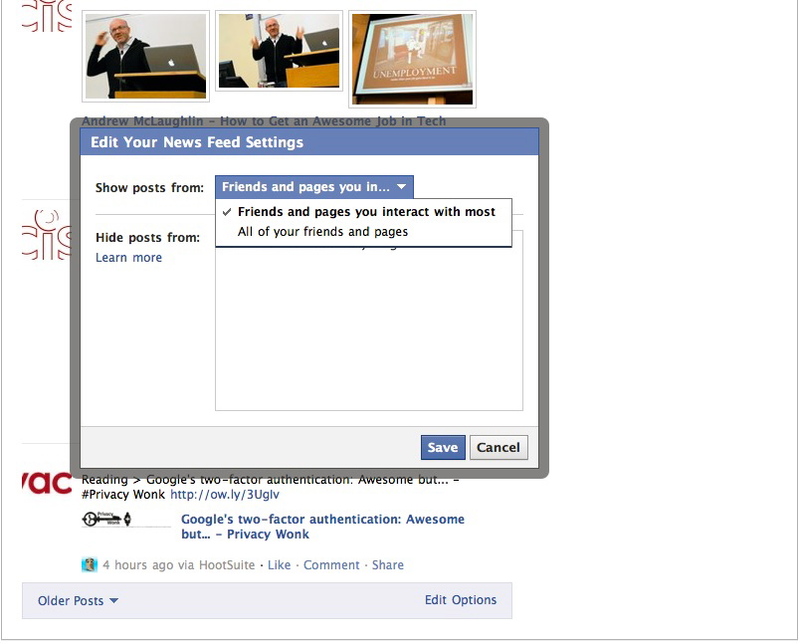 As you can see, my default setting was set by Facebook to show posts from”Friends and pages you interact with most”. Of course, I changed it immediately to show posts from “All your friends and pages”. None of my Facebook friends were aware of this default setting, and most of them are professionals, very well informed in social media matters. After changing the default setting, I learned that one of my friends’ daughters was Bat-mitzvahd, through a post that was hidden from me before I changed that setting, because this friend very rarely posts on Facebook. Another Facebook friend learned, only after changing her setting, that her cousin had a new baby. In my opinion, it smacks of censorship as practiced by the worst kind of despots. By introducing this kind of default setting and , on top of that, by not notifying users of this change, Facebook is basically deciding for its 600 million users what they can and cannot see on its platform. What is the motivation behind this latest change? More profit for Facebook, no doubt, even though I fail to grasp the exact logic behind it. I have understood by now, that as much as I want to believe, (or maybe Facebook wants me to believe) that I am the one using Facebook for my benefit, it is in reality Facebook that is using me for its benefit. Facebook’s tactics of taking away our privacy and our choices, little by little, reminds me of the tactics used by the most dangerous tyrants in human history. This excellent German video about the dangers of a sureveillance state, illustrates those tactics, as applied by governments. It explains the traditional metaphor of the frog: when frogs are put in a tub of hot water, they instinctively jump out, because it hurts too much (except on Glenn Beck’s show, where they die instantly). Frogs that are put in a tub of cold water stay, even after the temperature slowly increases until they cook alive. So it is with people. When surveillance is increased slowly, people don’t revolt. They just adapt, and refrain from showing and exptressing differing attitudes than the mainstream, knowing they are being observed and fearing of coming across as different. Next thing you know, you have a society where everyone behaves uniformly, where differences are not tolerated anymore and where democracy has disappered. Granted, Facebook is not to be compared to a “surveillance state”, but the tactics it uses to get its users slowly but surely “used” to its practices, certainly sound very similar to the tactics used by a surveillance state to achieve its objective.